What can I expect in a Fly Fishing Class? We do organized group classes /schools including a Fly Fish 101/Beginner class, and an Intermediate/Advanced Level Class . Also, we can design a school for your group, corporate outing, etc., as well as demos for clubs too! Inquire here and indicate your specific interest. In our classes we normally cover fly casting, knot tying and rigging,reading water, entomology, fly selection, and stream etiquette. Also, as part of the course we give students insight into the fly fishing opportunities locally, regionally, nationally, and even abroad. Our classes are hands on, we learn everything by doing. Some folks start the class having never fished at all, or having done no fishing of any kind. Others maybe have begun but need some direction. 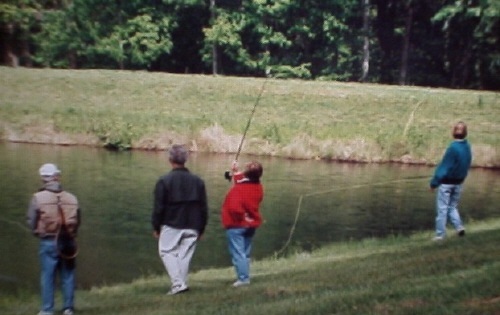 Still others have been fly fishing for a while and just want to learn or correct some bad habits. In any case I can help and would love to have you join me for a class. It is great to have something like fly fishing that you can have fun learning, see some beautiful places, and catch some fish too! March/April 2019 FLYFISHING BEGINNER/101 GTCC Class ….Introductory class designed to get you started in the sport of flyfishing. This class meets 4 sessions and includes a Sat field trip to conclude the class. We cover the basic principles of fly casting, reading water, fly selection, entomology, knot tying and rigging, equipment, and where to fish locally and abroad. Class is held from 6:30 – 9:00pm, and we meet at the GTCC Continuing Ed Building here in Greensboro. Cost $75.00 Registration will start in early spring 2019 and can be done by calling 336 334-4822. The class is listed in the “Live & Learn” Adult continuing education section. Class has 12 slots and are on a first come basis. Important!!!!! !>>>>>Note: Because the Class is run in conjunction with Guilford Technical College it handles the registration for the class. This class consists of (4)A 2.5 to 3hr sessions and one Saturday Field Trip . For questions regarding the class I can answer them so feel free to contact me at 336-944-3628 or by email jwflyfishing @gmail.com , but again…to register participants must register through GTCC. 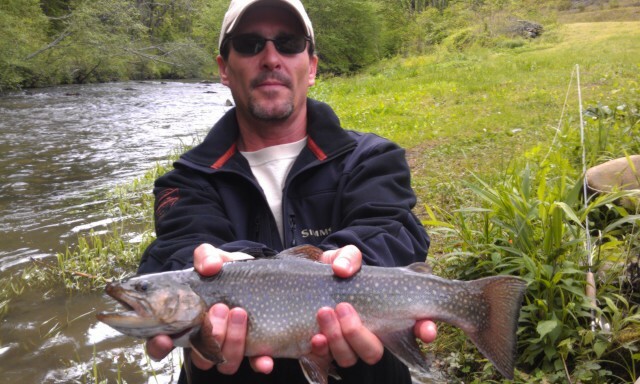 June 2019 FLYFISHING BEGINNER /101 GTCC Class (3 Classes are in June and a Field Trip). This class is the same as the above class only its a summer session class. All content is the same. This class , like the above, includes 4 2.5 hour sessions and a day field trip. This class has 12 slots and are on a first come first serve basis. Registration begins in April and students can register by calling 336-334-4822. Cost $75.00. 1) at some point For class you will need a rod and reel, 4 , 5, or 6 weight that is 8 to 9 feet long. Some folks already have rod/reel, some folks use the first class, in which we talk about equipment, as a way of figuring out what they need and then go shopping armed with that knowledge. For the first night I can provide a rod and reel for those without if I know well in advance of the first class. Field trip is a day trip to a local water. Sometimes we go to NC water, sometimes just north to a VA stream such as the Smith River, Rockcastle Creek Gorge, etc. September 2019 FLYFISHING BEGINNER/101 GTCC Class (3 Sept sessions AND FIELD TRIP October ) ….Introductory class designed to get you started in the sport of flyfishing. This class meets 4 sessions and includes a Sat field trip to conclude the class. We cover the basic principles of fly casting, reading water, fly selection, entomology, knot tying and rigging, equipment, and where to fish locally and abroad. Class is held from 6:30 – 9:30pm, and we meet at the GTCC Continuing Ed Building here in Greensboro. Cost $75.00. Registration will start in early spring 2014 and can be done by calling 336 334-4822. The class is listed in the “Live & Learn” Adult continuing education section. Class has 12 slots and are on a first come basis. Note: Because the Class is run in conjunction with Guilford Technical College it handles the registration for the class. This class consists of (3) 2.5 to 3hr sessions and one Saturday Day Field Trip . For questions regarding the class feel free to contact me at 336-944-3628 or by email jwflyfishing @gmail.com . Field trip is Sat , and is a day trip to a local water. Sometimes we go to NC water, sometimes just north to a VA stream such as the Smith River, Rockcastle Creek Gorge, etc. On The Water Fly Fishing School – Anytime! Due to customer interest we are offering what we call an On the Water Fly Fishing School. The one on one, one on two focus allows us to provide the same instruction we offer in our regular classes and do it on the river while under actual fishing conditions. I will be at your side teaching you to read water (find fish! ), cast, rig, and present your flies properly, how to hook, land, and release fish too. We will learn by DOING…just like the Nike saying goes “Just do it.” A great way to get someone into the sport. This instruction is by appointment just like a guided trip, you can book a day by calling 336.944-3628, or by email. Lasts approx 4 hrs. $175 for one angler, $275 for two anglers, or $375 for three anglers. Makes a great gift for a friend, family member, or loved one. Gift Certificates available. Waited til the last minute and can’t find a gift? No worry, we can do a last minute gift which is a printable e-Gift Certificate and have it in your hands with a couple of clicks. *NOTE: Our On the Water School is not a guided fishing trip. It is a lesson or instruction with a little bit of fishing. 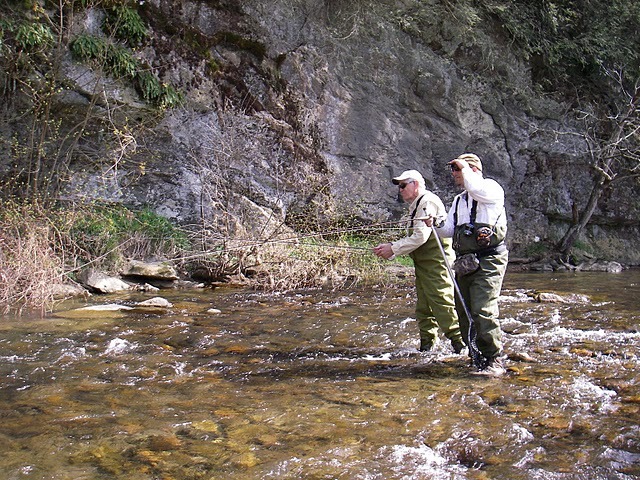 A guided fishing trip is a half or full day of fly fishing. I am a FFF Certified Instructor, so you can rest assured that your instruction is from a professional who dedicated to making sure that students get the most out of their educational experience. I received my training one-on-one from Macauley “Mac” Lord, who is the head instructor of the LL Bean Fly Fishing Schools. If you have been frustrated by fly casting, or maybe dealing with a nagging problem with your cast, I can help. I have invested thousands of hours not only learning casting myself, but also in teaching others. And I can teach those skills to others. Whether you want to learn to cast a fly rod, or whether its working on a specific problem with your cast, or maybe a tune up just before a big trip—-I can help. I offer FFF Certified Instruction in a number of ways, and I do organized private lessons for individuals and groups alike. 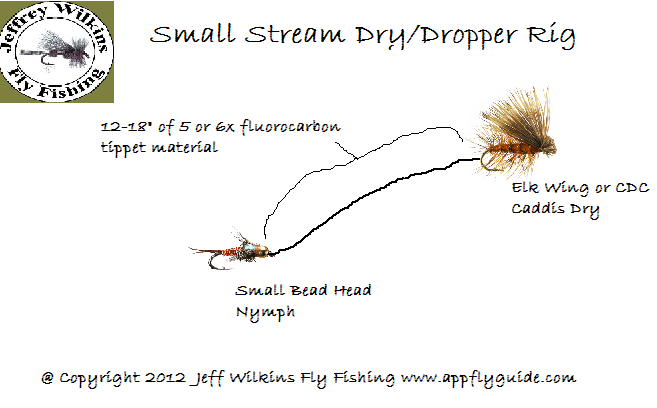 The instruction is based upon the Five Basic Principles of Fly Casting. To set up a lesson, or for questions or more information, please use the contact us button to make your request, or you may call me at 336.944.3628, or inquire by email. Normally, a potential student will call me and we will set up an individual appointment, and I can come to you or your home. Also, we’ll use some video to record your casting and provide you will a copy afterward for practice and self-analysis while practicing at home. 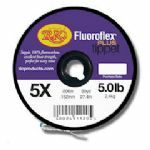 Its a great Rx for fixing many casting ills. I currently offer lessons I call Fly Casting 101, Intermediate Fly Casting, Small Stream Fly Casting, Fly Casting Large Rivers, Casting Heavier Rods, and Private Custom Lessons. For a detailed description of each of the above lessons email me or give me a call at (336) 944-3628. With ALL lessons I will use video clips to evaluate what we cover andshare with you feedback to use in your practice time at home. I also include handouts specifically relevant to what we cover during the lesson and you are free to keep them for future reference. The lesson is priced hourly but usually lasts about one hour and fifteen minutes to an hour an a half…in other words I don’t do the lesson looking at the clock to make sure we finish on the hour. Usually that amount of time is just right for what we need to cover but doesn’t wear the student out or overload them with more information or instruction than they can handle. We also offer other instruction on specific skill sets like Dry Fly Fishing, Fishing with Small patterns,Nymphing, Streamer Fishing, and more. This type of instruction usually is done onstream and lasts about 2-3 hours depending upon the type of lesson. Rate for this instruction ranges from $75 for one person to $125 for two people. For more info or to schedule this type of lesson contact me at 336.944.3628 or by email.